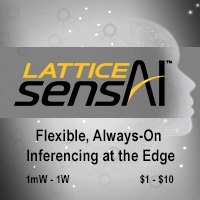 If you're interested in low-power, low-cost machine learning at the edge, attend Lattice Semiconductor's free webinar "Architecting Always-On, Context-Aware, On-Device AI Using Flexible Low-power FPGAs" on October 30, 2018 at 9 am Pacific Time, presented in partnership with the Embedded Vision Alliance. The speakers will be Deepak Boppana, the company's Senior Director of Marketing, and Gordon Hands, Marketing Director for IP and Solutions (and a highly-rated Embedded Vision Summit presenter). In this webinar, the presenters will leverage the company's experience in developing low-cost, low-power, always-on, vision-based AI solutions to illustrate deep learning inferencing design tradeoffs and explore optimizations across edge processing implementations ranging from 1 mW to 1 W and $1 to $10. For more information, and to register, see the event page.